The village, situated on the old Great North Road, was bypassed by the A1 in 1962. A roundabout connects the village with the bypass and B661 (Perry Road for nearby Grafham Water). Accessible through the village are The Offords via the B1043. Brampton is accessed through a grade-separated junction just north of the village on the A1. A long-planned improvement scheme for the A14 may see the road diverted north of the village to run parallel with the A1. 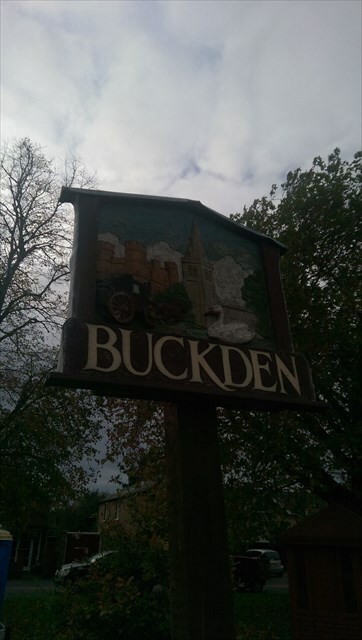 Formerly on the Great North Road (A1) out of London, Buckden is the location of Buckden Towers (or Buckden Palace), one of the many former residences of the Bishop of Lincoln. Buckden Towers also held Catherine of Aragon for a short period of time before she was moved to Kimbolton Castle.